This entry was posted on August 30, 2013 by admin. 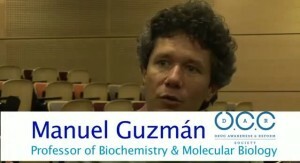 Manuel Guzmán was born in Madrid (1963) and took his BSc (1986) and PhD (1990) in Biology from Madrid Complutense University. He is presently Full Professor of Biochemistry and Molecular Biology at that university. His PhD and postdoctoral research focused on the study of the regulation of liver and brain lipid metabolism. During the last dozen years he has been mostly involved in the study of how the active components of cannabis (the cannabinoids) act in the body, with especial emphasis on the molecular mechanisms of that action and on understanding how cannabinoids control cell generation and death. This work has allowed characterizing new effects and signalling pathways evoked by cannabinoids, as well as putting forward new physiopathological implications derived from them. Drug Awareness & Reform (DAR) is a recognised society in the University College of Cork. It both works to spread awareness of the harmful effects of drugs and to promote alternatives to prohibition. UCC Drug Awareness & Reform is affiliated with Students for Sensible Drug Policy; an international network of students campaigning for evidence-based, humane and sensible drug laws as acknowledged with special consultative status within the United Nations.